While our current digital age of technological development is exciting and provides us with improved ways for communication, commerce, and transportation, the truth is that society is pretty stressed out. According to a study by the American Psychological Association, around 42% of adults experience more stress than ever before with 43% saying they have less sleep and constantly feel tired. Constantly being under stress can negatively impact your life. It can lead to being easily overwhelmed, fatigued and depressed. Several factors play out that can cause us to get stressed: money, career, and the general economy being the major cause for this. If you personally fall victim to stress, depression, and anxiety, then try these ideas to de-stress, feel better, relax, get energized and become happy. Smiling is probably one of the first things we learned as a baby. We innately do it without a particular reason; it just happens when we are feeling happy. Smiling has a number of health benefits. Scientific evidence suggests that it brings your heart rate to normal, reduces stress, induces endorphins to curb your mood, decreases pain, boosts the immune system, makes you look younger, and, most importantly, makes you more attractive. If these reasons are not enough to encourage you to smile, then nothing will. So give it a try. Watching movies instigate a variety of feelings from us. It can easily play out our emotions from sad, to scared, to happy, and to excited. Watching movies can even help with the feeling of being in love. But if you want to foster happiness, binge on tragically sad movies. A study by scholars from Ohio State University concluded that watching sad movies improves mood and prompts happiness in the heart of viewers. Sad movies often tackle loss, bravery and selfless eternal romance; all this combined makes one reconsider their own personal situation and more often than not, they feel better about their condition, grateful to have love ones, and develop a sense of gratitude toward their blessings. After all, happiness is a positive state of mind founded by being optimistic and guarded by the sense of contentment. Decide what mood you are in or want to be in and start watching. Many streaming video options even have categories tailored just to fit your emotions. Ever wonder why music is synonymous to parties, happy events, and a variety of occasions? Music uplifts our moods, and science can back that up. Listening to music improves our health by moderating our blood pressure, normalizing our heart rate, and reducing anxiety. According to a research from the University of Missouri, listening to music raises hormones that promote good mood in our body. In addition, listening to music also increases the synchronization of people, and that leads to liking and accepting each other more. Want to share your Spotify playlist? These practices originated eons ago and survived the test of time, but they are still as effective as ever for relaxation, calmness, rejuvenation and overall well-being. Yoga is a workout designed for physical, spiritual and mental stability, while meditation is considered a form of it. We easily take breathing for granted because we automatically do it without even thinking, but it can grant us something we all want: relaxation and focus. Simple deep-breathing exercises can effectively calm us down. 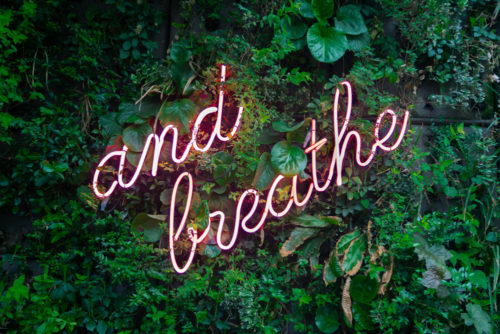 Slow and mindful breathing relieves stress, anxiety and decreases depression because it activates the parts of our brain that send out stress-prohibiting hormones. I for one, know I can use some techniques to help de-stress. I think most people aren’t even aware of how stressed they are until a muscle knots up and locks or they are at the point of exhaustion from being overwhelmed. We tend to just be the hamster in the cage, running and running after all that needs doing in our lives with our heads down against the wind. This post is great in helping remind us yo slow down and take a breath! I wonder though, does the smiling induce these endorphins etc… if we can just muster a smile in the midst of chaos? Or does it have to be accompanied with intention? Either way I suppose the more we muster the more its habitual! Thanks for commenting, Dee. There actually are studies that prove that smiling helps with relaxing and de-stressing. Here’s a helpful article: https://lollieshopping.com/smile-research. I’ve tested this theory myself. In the midst of manageable chaos, such as a hectic workday or bad traffic, I have found smiling to work. However, I would imagine than in a situation such as illness or something life-threatening that smiling wouldn’t do the trick. Although, Julia Louis Dreyfus, who recently battled breast cancer, did just say that she felt laughter truly is the best medicine. So, maybe when it’s a serious matter, smiling (and laughter) is a great addition to medical treatment.